Building upon our deep commitment to Brandeis’ pioneering spirit and mission, along with our strong interest in the university’s future, the 50th Reunion Planning Committee agreed to allocate $25,000 of our class gift to establish and endow the Class of 1961 Annual Lecture Series. We enjoyed a remarkable 50th Reunion in May, fondly reconnecting with classmates, embracing Brandeis memories and reflecting on how the university shaped our life’s journeys and molded us into the unique individuals we’ve become. Thanks go out to the highly enthusiastic classmates who joined me in volunteering to serve on the planning committee, which was chaired by Steve Reiner and Bruce Litwer. They included Phyllis Chasanow Richman, Ed Feldstein, Steve Bluestone, Sandy Cutler Bernstein, Ron Carner, Stan Davis, Susan Douglas Feibus, Jeff Golland, Zina Finkelstein Jordan, Leslie Neiman Kingsley, Walt Klores, Bob Lapides, Norm Merwise, Paula Resnick, Sharon Pucker Rivo, Judy Leavitt Schatz, Mike Schatz, Judy Silverson Sloan, M. Glee Snyder, Judy Liskov Zabin and Marty Zelnik. Additional thanks to Elisa Gassel ’01 and Lorraine Sparrow, our capable and helpful assistants from the Office of Development and Alumni Relations. One of the most inspired outreach ideas was Bob Lapides’ creation of a class website on yahoo.com for classmates to reconnect prior to the Reunion. A flurry of emails ensued on a variety of topics, including professors (Leo Bronstein, Herbert Marcuse, Max Lerner and Abraham Maslow), students (Abbie Hoffman ’59, Marty Peretz ’59 and Letty Cottin Pogrebin ’59), celebrity visitors (Marc Chagall, David Ben Gurion), places (Saldi’s, Brigham’s, Jack and Marian’s, Ken’s Steak House, Cambridge haunts), events (Chris Connor Jazz Concert, freshman year Brandeis/Boston College basketball brawl) and issues (civil rights, women’s movement, gay and lesbian rights, arts and politics). Stephen Rose, Ph.D.’70, just celebrated his 50th wedding anniversary with Wilma Webber ’60. They have two kids and four grandkids. He was a Fulbright Scholar at the University of Helsinki in 2003. He has written five books and a number of professional articles. 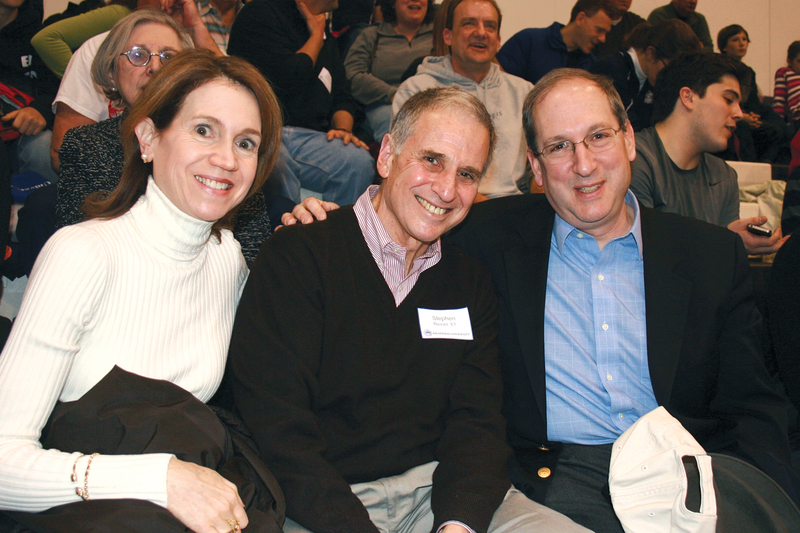 Kathy Lawrence, Trustee Steve Reiner ’61 and President Fred Lawrence joined about 200 Brandeis alumni to cheer on the men’s and women’s basketball teams against host New York University. joined about 200 Brandeis alumni to cheer on the men’s and women’s basketball teams against host New York University.